The chemical structure of ethylene, the simplest alkene. In organic chemistry, an alkene, olefin, or olefine is an unsaturated chemical compound containing at least one carbon-to-carbon double bond. The simplest alkenes, with only one double bond and no other functional groups, form a homologous series of hydrocarbons with the general formula CnH2n. The simplest alkene is ethylene (C2H4), which has the International Union of Pure and Applied Chemistry (IUPAC) name ethene. Alkenes are also called olefins (an archaic synonym, widely used in the petrochemical industry) or vinyl compounds. As predicted by the VSEPR model of electron pair repulsion, the molecular geometry of alkenes includes bond angles about each carbon in a double bond of about 120 degrees. The angle may vary because of steric strain introduced by nonbonded interactions created by functional groups attached to the carbons of the double bond. 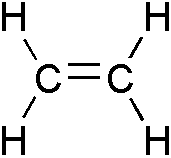 For example, the C-C-C bond angle in propylene is 123.9 degrees. The alkene double bond is stronger than a single covalent bond and also shorter with an average bond length of 133 picometres. Like single covalent bonds, double bonds can be described in terms of overlapping atomic orbitals, except that unlike a single bond (which consists of a single sigma bond), a carbon-carbon double bond consists of one sigma bond and one pi bond. Each carbon of the double bond uses its three sp2 hybrid orbitals to form sigma bonds to three atoms. The unhybridized 2p atomic orbitals, which lie perpendicular to the plane created by the axes of the three sp2 hybrid orbitals, combine to form the pi bond. Because it requires a large amount of energy to break a pi bond (264 kJ/mol in ethylene), rotation about the carbon-carbon double bond is very difficult and therefore severely restricted. As a consequence, substituted alkenes may exist as one of two isomers called cis isomers and a trans isomers. For example, in cis-2-butylene the two methyl substituents face the same side of the double bond and in trans-2-butylene they face the opposite side. It is certainly not impossible to twist a double bond. In fact, a 90 degree twist requires an energy approximately equal to half the strength of a pi bond. The misalignment of the p orbitals is less than expected because pyridalization takes place. Trans-Cyclooctene is a stable strained alkene and the orbital misalignment is only 19 degrees with a dihedral angle of 137 degrees (normally 120 degrees) and a degree of pyramidalization of 18 degrees. This explains the dipole moment of 0.8 D for this compound (cis-isomer 0.4 D) where a value of zero is expected. The trans isomer of cycloheptene is only stable at low temperatures. The physical properties of alkenes are comparable with alkanes. The physical state depends on molecular mass (gases from ethene to butane, liquids from pentene onwards). The simplest alkenes, ethylene, propylene, and butylene are gases. Linear alkenes of approximately five to 16 carbons are liquids, and higher alkenes are waxy solids. Alkenes are relatively stable compounds, but are more reactive than alkanes due to their double carbon-carbon bond. Although stronger than the single carbon-carbon bond in alkanes, the majority of the reactions of alkenes involve the rupture of this double bond, forming two new single bonds. The most common industrial synthesis path for alkenes is cracking of petroleum. Other alcohol eliminations are the Chugaev elimination and the Grieco elimination in which the alcohol group is converted to a short-lived intermediate first. An elimination reaction from an alkyl amine occurs in the Hofmann elimination and the Cope reaction to produce alkenes. Catalytic synthesis of higher α-alkenes can be achieved by a reaction of ethylene with the organometallic compound triethylaluminium in the presence of nickel, cobalt, or platinum. Alkenes scramble in an olefin metathesis. Alkenes can be generated from carbonyl compounds, such as an aldehyde or ketone, by a variety of reactions. Alkenes can be generated from coupling reactions of vinyl halides. Alkenes can be generated by the selective reduction of alkynes. Alkenes rearrange in the Diels-Alder reaction and an Ene reaction. Alkenes are generated from α-halo sulfones in the Ramberg-Bäcklund Reaction. Multisubstituted alkenes can be formed from alkynes in carbometalation with various organometallic reagents. For unsymmetrical products, the more substituted carbons (those with fewer hydrogens) tend to form more stable sites for double bonds (see Saytzeff's rule). Alkenes serve as a feedstock for the petrochemical industry because they can participate in a wide variety of reactions. Alkenes react in many addition reactions, which occur by opening up the double-bond. Electrophilic addition: Most addition reactions to alkenes follow the mechanism of electrophilic addition. An example is the Prins reaction where the electrophile is a carbonyl group. It is also used as a quantitive test of unsaturation, expressed as the bromine number of a single compound or mixture. The reaction works because the high electron density at the double bond causes a temporary shift of electrons in the Br-Br bond causing a temporary induced dipole. This makes the Br closest to the double bond slightly positive and therefore an electrophile. Hydrohalogenation: Addition of hydrohalic acids such as HCl or HBr to alkenes yields the corresponding haloalkanes. If the two carbon atoms at the double bond are linked to a different number of hydrogen atoms, the halogen is found preferentially at the carbon with fewer hydrogen substituents (Markovnikov's rule). Addition of a carbene or carbenoid yields the corresponding cyclopropane. Alkenes are oxidized with a large number of oxidizing agents. In the presence of oxygen, alkenes burn with a bright flame to produce carbon dioxide and water. Polymerization of alkenes is an economically important reaction which yields polymers of high industrial value, such as the plastics polyethylene and polypropylene. Polymerization can either proceed via a free-radical or an ionic mechanism. When an alkene has more than one substituent, the double bond geometry is described using the labels E and Z. These labels come from the German words "entgegen" meaning "opposite" and "zusammen" meaning "together." Alkenes with the higher priority groups on the same side of the double bond have these groups together and are designated "Z." Alkenes with the higher priority groups on opposite sides are designated "E."
↑ Barrows, Susan E., and Eberlein, Thomas H., Understanding Rotation about a C=C Double Bond. Retrieved November 1, 2007. This page was last modified on 7 March 2016, at 22:00.